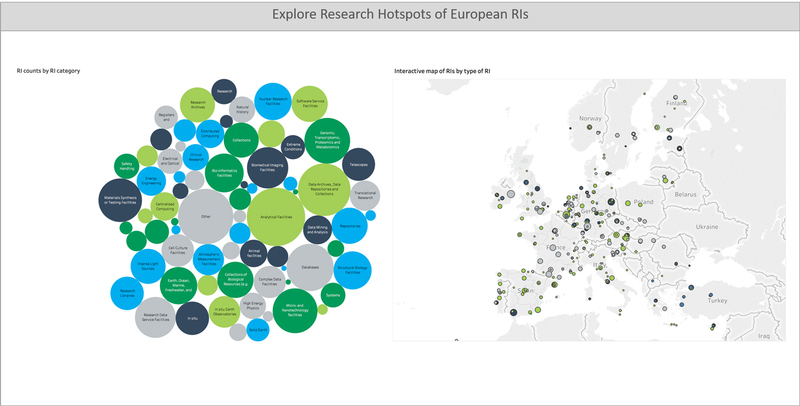 MERIL (Mapping of the European Research Infrastructure Landscape) has introduced an additional data visualisation tool that allows you to discover the MERIL dataset interactively and provides you with the visual ‘big picture’ of the research infrastructure landscape in Europe. The new tool gives you more freedom to choose how you filter the dataset and visualise the results in the different dashboards. You can quickly see and explore information on the European research landscape, such as RI size and location, user profiles, and research capabilities of over 1,000 research facilities across the continent. The data visualisation tool is designed to help you discover information on research infrastructures, with the aim of encouraging new partnerships and collaborations. It will also assist policy-makers by helping to build a picture of the distribution of facilities across a country or the continent, and thereby identify where there may be capability hotspots or gaps in infrastructure accessibility. If you have any questions or comments, please contact the MERIL team at meril@esf.org.